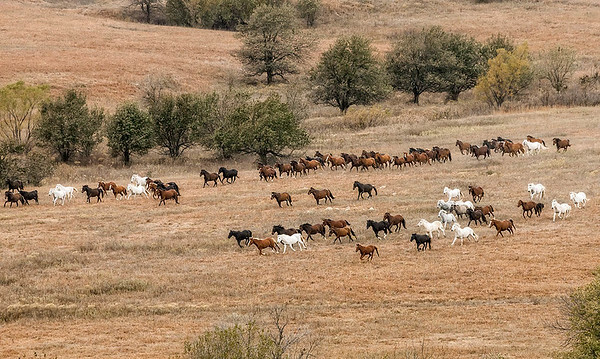 This herd of mustangs lives on a large ranch southeast of Cassoday, Kansas, and were being moved to another pasture. I had a fortuitous observation point on a neighboring ridge as they ran through this wooded draw. Western Greenwood County, Kansas, October 31, 2017. 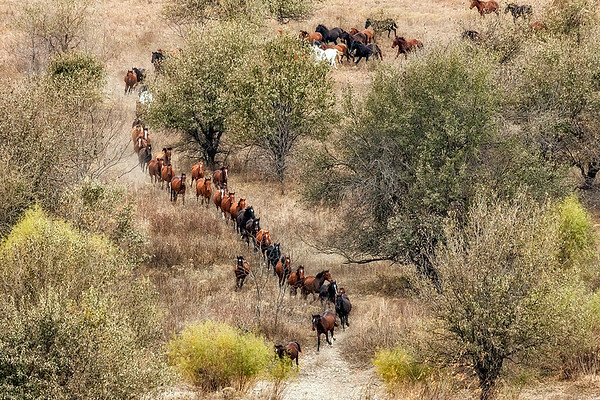 The Bureau of Land Management contracts with several ranches in Kansas and Oklahoma to pasture wild mustangs removed from public lands in western states. Western Greenwood County, Kansas. October 31, 2017. Named for the creek it parallels and fords several times, Coyne Creek Road is no thoroughfare. Signs at each end of the road advise traveling at the driver's own risk. 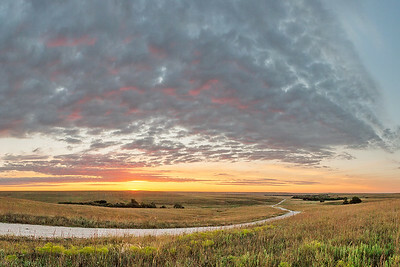 Western Chase County, Kansas. October 20, 2017. Named for the creek running through the trees in the distance, Coyne Creek Road is no thoroughfare. Signs at each end of the road advise traveling at the driver’s own risk. 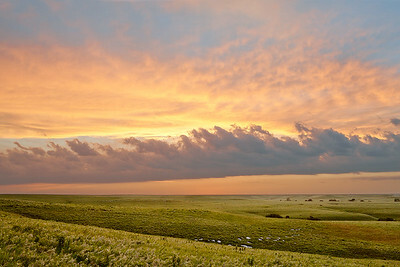 Western Chase County, Kansas. October 17, 2017. 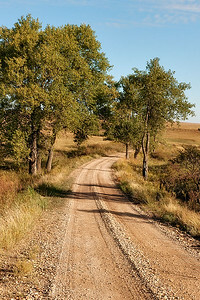 Salyard Road, also known as B Road, runs north and south in western Greenwood County, Kansas. September 28, 2017. Coyne Creek is a spring-fed branch in western Chase County, flowing into the Cottonwood River near Clements. At both ends of Coyne Creek Road are signs reading “Minimum maintenance - travel at your own risk.” The road crosses the creek at several fords like the one shown. June 26, 2016. A friend and I were standing atop Harsh Hill, along Battle Creek Road southeast of Cassoday, eager to photograph the sunrise. While it was lovely, I turned my back to the sun and encountered this scene. The tall grasses are mainly big bluestem and Indiangrass. On the Shadow Valley Ranch in Butler County, Kansas. September 12, 2015. 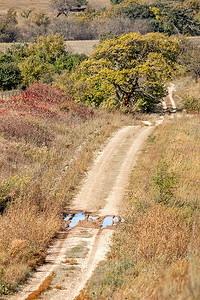 Folks from this part of the Flint Hills know this spot along Battle Creek Road southeast of Cassoday as Harsh Hill. On the Shadow Valley Ranch in Butler County, Kansas. September 12, 2015. Roundup on the Shadow Valley Ranch begins at dawn. 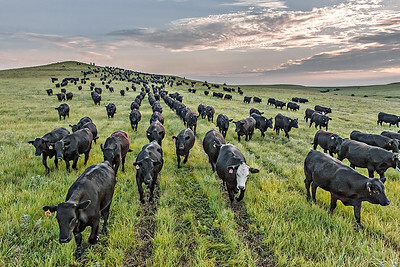 Beginning from a gathering pasture, the cattle are walked slowly about three miles to the ranch headquarters to be weighed and loaded on trucks. 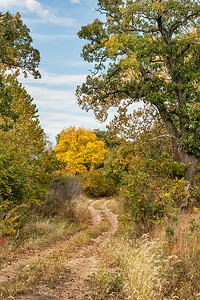 On the Shadow Valley Ranch near Cassoday in Butler County, Kansas. July 22, 2015. 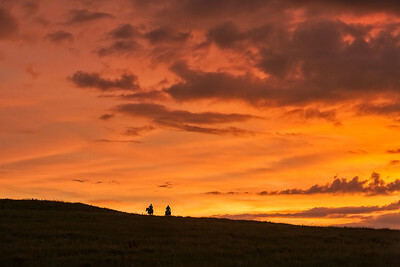 Gwen Hoy, of the Flying W Ranch, outfitted me with a horse so I could join them in a sunrise roundup. Before I was settled in the saddle, Jim Hoy pointed up the hill saying, "There's your shot!" On the Shadow Valley Ranch in Butler County, Kansas. July 21, 2015. Teter Rock is twelve miles east of Cassoday in Greenwood County, Kansas. 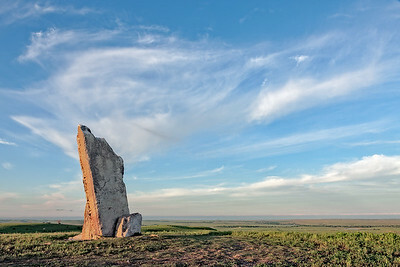 In the 1950s, James Murle Teter persuaded an oil pipeline crew to drag this limestone monolith a couple of miles and erect it on a ridge that divides the Cottonwood, Verdigris, and Walnut watersheds. 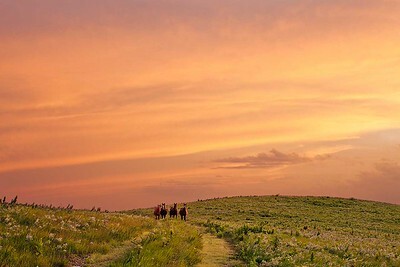 There's a fascinating Teter Rock chapter in Jim Hoy's book, Flint Hills Cowboys. May 31, 2015. Roundup on the Shadow Valley Ranch begins at dawn. 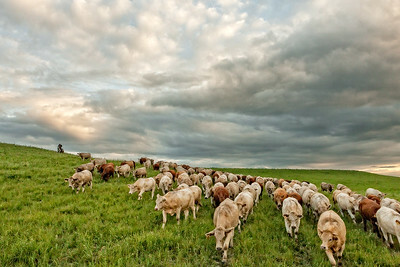 Beginning from a gathering pasture, the cattle are walked slowly behind a feed truck about three miles to the headquarters to be weighed and loaded on trucks. I perched on the back of the feed truck for this perspective. On the Shadow Valley Ranch near Cassoday in Butler County, Kansas. July 25, 2014. These four mustangs are investigating my presence in their pasture at sundown. On the Shadow Valley Ranch near Cassoday in Butler County, Kansas. June 19, 2014. On the Shadow Valley Ranch, near Cassoday, in Butler County, Kansas. June 19, 2014.